This niche development, nestled in a quiet side street behind Sothearos Boulevard in Tonle Bassac (next to BKK1), offers an enviable combination of convenience through its strategic location and seclusion. Tonle Bassac is set to become Phnom Penh's newest and most exciting lifestyle hub with exciting new retail projects underway within a 1km radius of Habitat. Habitat is the place to live, connect, and play - in a stylish, elegant and secluded environment. 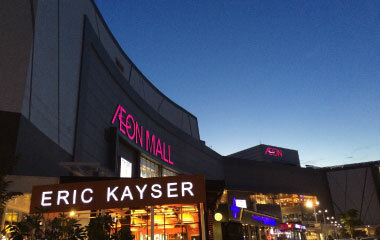 Habitat is located a mere 200m from Aeon Shopping Centre - a luxury shopping centre offering a large array of boutiques, cafes and restaurants, children’s entertainment, a bowling alley, ice skating, a movie theatre, Aeon grocery store and many other services. 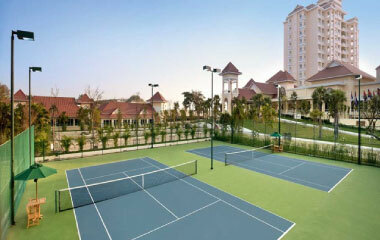 Sofitel Phokeethra located 450 meters from Habitat has facilities such as a gym, pool, and tennis courts. Also nearby (500m) is The Place, Cambodia’s largest gym that sits on 4 floors with state of the art equipment, classes and a 25m lap swimming pool. Bassac Lane, the trendiest restaurant strip in Phnom Penh, sits 550m from Habitat. Featuring several unique restaurants and bars by the Norbert-Munns brothers, plus a few more, your options for dinners and after-work drinks will be near and numerous. Less than 900 meters north is the soon to be completed NagaWorld 2 comprising of two five-star hotels, world-standard gambling, a theatre for international performances that can accommodate 3,000 people, a department store, and a cafeteria, as well as swimming pool on the rooftop. Naga City Walk also under construction is a $369 million two-level pedestrian mall with 4000 sqm of retail space aimed at the ultra luxury market. It is linked to the existing NagaWorld Hotel and Casino and hotel rooms, shops and convention facilities.